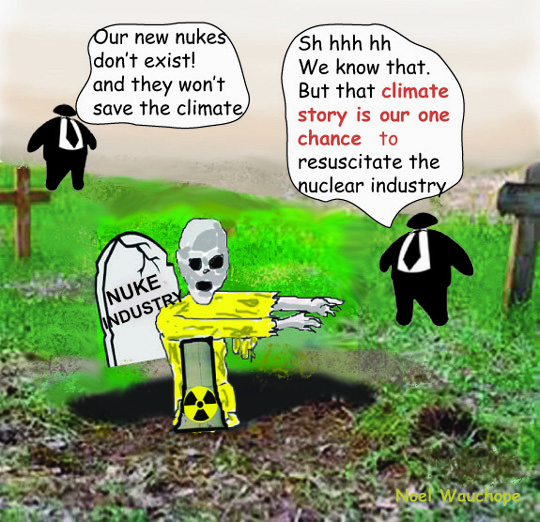 The nuclear lobby is desperately pitching its new gimmicks – to governments (nobody else would put their money in) They come up with all sorts of new titles, with appropriate abbeviations – Small Modular Reactors (SMRs) , Small and Medium Reactors, (also SMRs) Micro Reactors, Liquid Fluoride Thorium Reactors (LFTRs) , Integral molten Salt Reactot (IMSR), Virtual Test Reactor, (VTR) – to name just a few . So -new nuclear reactors leave a smaller amount of radioactive trash? But it’s so highly toxic that it requires the same volume of space for its final disposal. The reactors themselves become radioactive trash eventually. Mixed-oxide (MOX) nuclear fuel reprocessing turns out to be twice as expensive as burial of nuclear wastes. according to an unreleased US Department of Energy report – and the World Nuclear Association knows this! In London yesterday, police arrested 963 people who were part of the Extinction Rebellion climate protest. This movement is continuing, and spreading to other countries. They will also set up a political taskforce to take forward public negotiations with the Government. Climate awareness is gathering momentum. Still, climate scientists seem unwilling and perhaps unable to talk to the general public, to explain the basic facts on climate change, and the complicating factors, such as the effects on oceans warning, on sea ice loss, on air current changes, on low pressure areas, the polar vortex. There are two climate scientists who do make this effort. Paul Beckwith has made over 200 YouTube videos, and he does tackle the complicated science in an understandable way. Katherine Hayhoe almost deceptively makes climate science seem simple, and is well known for her entertaining video series Global Weirding. This newsletter was always intended to inform on the nuclear threat. It’s just that the climate situation is now a global emergency. Earth’s surface temperature steadily rose from 2003. https://www.youtube.com/watch?v=6cRCbgTA_78 https://www.youtube.com/watch?v=0Tpzwqlj-d4 Extinction Rebellion can act as a catalyst for political debate and change . Climate action: Invest in low-carbon but not in nuclear . Nuclear power plants in no way designed, or ready for, climate change extremes. “There is no such thing as a zero or near-zero-emission nuclear power plant”. Climate Change Could Unleash Long-Frozen Radiation. Debunking All The Smears Against Julian Assange. EUROPE. More disappointments for Europe’s new nuclear stations– no nuclear future for Europe? UKRAINE. Life as a liquidator after the 1986 Chernobyl nuclear disaster. Chernobyl: How bad was it? . ‘We will never stop fighting’: Greta Thunberg joins London climate protest. https://www.youtube.com/watch?v=Pv9EkxudXmw Climate change rallies block London roads . Extinction Rebellion: The activists risking prison to save the planet. Britain’s slow path to zero carbon emissions. Britain’s Nuclear Free Local Authorities (NFLA) notes that over 70 Welsh councils formally reject hosting nuclear waste dump. UK’s EPA concerned over proposals for Sizewell new nuclear power station in Suffolk. Nuclear Transparency Watch warns on the unwisdom of UK government subsidising Small Modular Nuclear Reactors (SMRs). JAPAN. Japan Atomic Power looks to a big business in cleaning up dead nuclear plants. Japan’s plutonium surplus, its history, and its danger. Japan’s massive task to clean up nuclear fuel pools of Fukushima stricken reactors. Hazardous removal of spent fuel rods is just one step in the long Fukushima nuclear clean-up. Japan has a new kind of visa to lure foreign blue collar workers for Fukushima clean-up. An emerging hopeful trend for US nuclear weapons policy. U.S. Ignored Russia’s Nuclear War Prevention Pact – Reports. Trump’s administration speeds up the revolving door between Pentagon and nuclear weapons companies. Trump administration stops govt practice of disclosing numbers of nuclear weapons. Pentagon’s strange and dangerous plan for small nuclear reactors at the battle scene. On climate change impacts, nuclear lobby has captured the regulators. A conservative backlash against Trump, as he appoints fossil fuel insiders to federal agencies? Frida Berrigan’s personal story about nuclear weapons. Holtec’s nuclear decommissioning and wastes empire to grab Indian Point. U.S. Department of Energy seeks new certification for its Waste Isolation Pilot Plant. North Dakota prohibits nuclear waste dumping in the state. State subsidies for nuclear power in USA are simply not necessary. America’s nuclear lobby spending up big to get $millions in State subsidies. AARP Ohio, on behalf of its 1.5 million members and families, strongly opposes Ohio nuclear subsidies. U.S.nuclear bailouts – Exelon and the death of competitive energy markets. U.S. Supreme Court rejects challenge to nuclear subsidy. Lawsuit against Santee Cooper, claims that investors were deceived over nuclear project risks. The long-lasting unsolved problem of Three Mile Island’s radioactive trash. Three Mile Island, and the nuclear industry’s legacy of cancer. USA Congressmen concerned at slow clean-up of dangerous San Onofre nuclear site. Conflicts of interest in the Trump group’s push to sell nuclear reactors to Saudi Arabia. USA is preparing more charges against Julian Assange. FRANCE. Some consternation in France, as EDF plans to split off its nuclear section. Electricite de France (EDF) €33 billion debt, and more problems – its nuclear section to be nationalised. EDF’s Belleville nuclear power plant to continue to have increased monitoring by France’s nuclear regulator. CHINA. China gambles on untested “Hualong One” nuclear reactor, and plans for international sales. RUSSIA. Putin’s new super-dooper longest submarine packed with nuclear torpedoes. More countries headed to go into nuclear debt to Russia. INDIA. Dangerous electioneering: India’s Modi ramps up the nuclear weapons rhetoric. CANADA. Canada’s Came co Corp slow to clean up groundwater contaminated with uranium at Saskatchewan mill. BANGLADESH. China keen to sell nuclear reactor to Bangladesh – an inflated and costly project. FINLAND. Finland to start constructing nuclear plant with Russian reactor in 2021 . ISRAEL. History of Israel getting nuclear weapons. Like when one man insists on pushing himself on a woman who isn’t at all interested! Members of a civic group celebrate in Seoul on April 12, 2019, after the World Trade Organization ruled the previous day in favor of the country’s ban on imports of some Japanese fishery products introduced in the wake of the 2011 Fukushima nuclear disaster, reversing an earlier decision against the restrictions. TOKYO(Kyodo) — Japan on Tuesday urged South Korea to lift import restrictions on Japanese seafood introduced in the wake of the 2011 Fukushima nuclear disaster, even after the World Trade Organization ruled in favor of Seoul over the issue. Kenji Kanasugi, head of the Japanese Foreign Ministry’s Asian and Oceanian Affairs Bureau, told his South Korean counterpart Kim Yong Kil in Tokyo that Japanese seafood is free of radioactive contamination and safe to eat, according to Japanese sources familiar with the matter. During the talks, the South Korean Foreign Ministry insisted the restrictions are legitimate due to it wishing to prioritize the “health and safety” of the people. Seoul imposed a ban on some types of seafood products from eight prefectures, including Aomori, Fukushima, and Chiba, in the wake of the 2011 reactor core meltdowns at the Fukushima Daiichi nuclear power plant triggered by a powerful earthquake and tsunami. It expanded the ban in September 2013 to include all seafood products from the eight prefectures, and added a requirement that Japanese companies attach safety certificates when any traces of radiation are found in seafood from other regions. In August 2015, Tokyo filed a complaint with the WTO against the restrictions, which it considers unfair discrimination, and an initial ruling by a dispute settlement panel sided with Japan. South Korea appealed the decision, however, and the WTO’s appellate body, the highest judicial entity of its dispute settlement mechanism, ultimately ruled in Seoul’s favor on April 11. During Tuesday’s meeting, Kanasugi and Kim also made no progress towards a resolution in the dispute concerning recent South Korean top court rulings ordering Japanese companies to pay compensation for wartime forced labor. Japan maintains that the issue has been resolved “finally and completely” under a 1965 accord between the two countries to settle property claims signed alongside the Japan-South Korea treaty that established diplomatic ties. Kanasugi reiterated Japan’s call to open consultations between the governments based on the accord and asked South Korea to take measures to protect Japanese companies from facing any economic damage stemming from the rulings. But Kim neither accepted nor refused the request, according to the sources. I am sure that some of our american friends will be interested to know that there is not enough beef in the U.S., that U.S. needs to import Fukushima beef!!! Farmers harvest onions in Minamisoma, Fukushima Prefecture. FUKUSHIMA – Exports of agricultural products produced in Fukushima Prefecture rose about 2 percent in fiscal 2018 to a record 217.8 tons, according to the prefectural government. Fukushima’s agricultural exports suffered a long slump due to the 2011 nuclear crisis. But exports hit a record high for the second straight year, backed by an expansion in rice exports to Malaysia in fiscal 2017 and in exports of Japanese pears and other items to Vietnam and Thailand in fiscal 2018. In fiscal 2018, which ended last month, exports of peaches and Japanese persimmons were sluggish due in part to unfavorable weather. Shipments of rice to Malaysia, at about 115 tons, led the total exports, as in fiscal 2017. Exports of apples to Thailand and beef to the United States also grew. Following the disaster at the Fukushima No. 1 nuclear plant, the prefecture’s agricultural exports plunged due to import restrictions by countries concerned about radioactive contamination, falling to 2.4 tons in fiscal 2012. The prefectural government has strengthened efforts to boost exports to Southeast Asian countries since the restrictions were scrapped. In fiscal 2017, Fukushima’s agricultural exports came to 213.3 tons, exceeding the then-record of 152.9 tons in fiscal 2010, helped by about 101 tons of rice shipments to Malaysia. The madmen’s denial continues, pretending that it is all clean and safe. Like if nothing ever happened. Children’s future sacrificed in the name of politicians’ holy economics. Children exercise at the J-Village national soccer training center in the town of Naraha, Fukushima Prefecture, on Saturday after it resumed full operations. FUKUSHIMA – The J-Village national soccer training center in Fukushima Prefecture resumed full operation Saturday, eight years after it was converted into an operational base to cope with the nuclear disaster that hit the prefecture in 2011. The facility, established in 1997, has already been selected as the starting point for the Japan leg of the 2020 Tokyo Olympic torch relay, a move aimed at highlighting the country’s efforts to recover from the devastating earthquake and tsunami on March 11, 2011, that triggered the meltdown at the Fukushima No. 1 nuclear plant. The torch relay will start at the facility in March 2020. Until March 2017, the training center was used as a logistics hub and a lodging facility for workers involved in the cleanup and other disaster response operations at the crippled facility located some 20 kilometers to the north. The operational base function has been moved to the power plant. The training complex has been renovated, and an indoor practice field and hotel with conference rooms have been added. A large part of the complex had already resumed operations by July 2018, with the exception of two playing fields. Also on Saturday, East Japan Railway Co. opened a new station near the J-Village. “I hope (the full reopening) will contribute to Fukushima’s revival,” said a 42-year-old woman arriving at the station on Saturday morning. The woman, who lives in the prefecture, was planning to visit the J-Village site. Japanese Justice Minister Takashi Yamashita has outlined a restriction pertaining to the country’s new visa program. He said foreign nationals won’t be allowed to work in Japan if their main task is to do decontamination work at the crippled Fukushima Daiichi nuclear power plant. Yamashita’s remark on Friday follows the plant operator’s statement that it will accept foreign workers hired under the new visa program to help decommission the facility. Tokyo Electric Power Company says that construction, industrial machinery and automobile maintenance will be relevant to the decommissioning. The utility told the contractors to make sure they hire foreign workers legally. TEPCO also says it’s not aware of a shortage of workers in the decommissioning process, but that it is up to the contractors to decide whether to hire foreigners under the new visa category. Yamashita said that the Justice Ministry and other relevant ministries will ensure that foreigners in the program are eligible for the jobs they are hired to do. Yamashita said foreigners coming to work in the construction sector must not be hired if their main job is decontamination work. Chief Cabinet Secretary Yoshihide Suga said the industry ministry will supervise TEPCO to make sure the utility’s operations are legal and that the plant’s reactors are decommissioned safely and stably. A revised immigration law that took effect on April 1 allows foreign nationals with certain vocational skills to work in a range of sectors under a new visa category. Rows of storage tanks hold radiation-contaminated water on the grounds of the Fukushima No. 1 nuclear power plant. Tokyo Electric Power Co. plans to use the new visa program to deploy foreign workers to its crippled Fukushima No. 1 nuclear plant, sparking concerns that language barriers could cause safety hazards and accidents. The specified skills visa program started in April to alleviate labor shortages in 14 different industrial sectors. TEPCO says it has long lacked enough workers for decommissioning work at the Fukushima nuclear plant. At a March 28 meeting, the utility explained its plan to hire foreign workers to dozens of construction and other companies that have been contracted for decommissioning work. TEPCO officials asked the companies to be aware that workers sent to radiation monitoring zones must wear dosimeters and receive special education about the dangers they will face. The new work visa program requires the foreign workers to have a minimum level of Japanese language ability needed for daily life. But TEPCO officials reminded the company representatives that Japanese language skills would be even more important at the Fukushima plant because of the need to accurately understand radiation levels and follow instructions by superiors and colleagues regarding work safety. TEPCO officials said they would ask the contracting companies to check on the Japanese language skills of prospective foreign workers. But at least one construction company has already decided not to hire any foreign workers. According to TEPCO officials, an average of about 4,000 people work at the nuclear plant each day, mostly in zones where radiation levels must be constantly monitored. To stay within the legal limits on exposure levels, workers often have to be replaced, leading to difficulties for TEPCO in gathering the needed number of workers. Between April 2018 and February this year, 11,109 people worked at the Fukushima plant. Of that number, 763 were found to have levels of radiation exposure between 10 and 20 millisieverts, while 888 had levels between 5 and 10 millisieverts. The legal limit for radiation exposure for workers at nuclear plants is 50 millisieverts a year, and 100 millisieverts over a five-year period. The Justice Ministry has disciplined companies that used technical intern trainees for decontamination work without adequately informing them of the dangers. The ministry has also clearly stated that such trainees are prohibited from doing decommissioning work at the Fukushima plant. However, Justice Ministry officials told TEPCO that foreigners with the new visa status could work alongside Japanese staff at the nuclear plant. Although their numbers are small, foreign workers and engineers have been accepted at the Fukushima plant. As of February, 29 foreigners had been registered as workers engaged in jobs that expose them to radiation. A construction company official said such foreign workers were hired after their Japanese language ability was confirmed. But concerns remains on whether the new foreign workers will be able to properly understand how much radiation exposure they have experienced. Kazumi Takagi, a sociology professor at Gifu University, has conducted interviews with nuclear plant workers. The Tokai No. 2 plant (right) operated by Japan Atomic Power Co. in Ibaraki Prefecture, is seen in this photo taken last July. Japan Atomic Power Co. is considering setting up a subsidiary specializing in the scrapping of retired nuclear reactors at domestic power plants, sources close to the matter said Tuesday. Japan Atomic Power, a wholesaler of electricity generated at its nuclear plants, is planning to have U.S. nuclear waste firm EnergySolutions Inc. invest in the reactor decommissioning service unit, which would be the first of its kind in Japan, the sources said. The Tokyo-based electricity wholesaler, whose shareholders are major domestic power companies, will make a final decision by the end of this year, they said. The plan is to support power companies’ scrapping of retired reactors using Japan Atomic Power’s expertise in decontaminating and dismantling work, in which it has been engaged in since before the 2011 nuclear disaster at Tokyo Electric Power Company Holdings Inc.’s Fukushima No. 1 complex, according to the sources. The plan comes as a series of nuclear reactor decommissioning is expected at power companies in the country. Since stringent safety rules were introduced after the Fukushima disaster, 11 reactors, excluding those at the two Fukushima plants of Tepco, are slated to be scrapped. Nuclear reactors are allowed to run for 40 years in Japan. Their operation can be extended for 20 years, but operators will need costly safety enhancement measures to clear the Nuclear Regulation Authority’s screening. Decommissioning a reactor with an output capacity of 1 million kilowatts is said to take about 30 years and cost around ¥50 billion. Typically, some 500,000 tons of waste result from scrapping such a reactor, and 2 percent of the waste is radioactive. Japan Atomic Power first engaged in decommissioning a commercial reactor in 2001 at its Tokai plant in eastern Japan. It has been conducting decommissioning work at its Tsuruga nuclear power plant in western Japan since 2017. It is also providing support to Tepco for the decommissioning of reactors at the Fukushima No. 1 plant. EnergySolutions, founded in 2006, has engaged in scrapping five reactors in the United States. Japan Atomic Energy and EnergySolutions have had previous business ties, and the Japanese company has sent some employees to the Zion nuclear station in Illinois, where the U.S. partner has been conducting decommissioning work since 2010. During a visit Sunday, Prime Minister Shinzo Abe listens as technicians explain the current situation at the Fukushima No. 1 nuclear power plant in Okuma, Fukushima Prefecture. A ‘nuclear’ submarine can refer to a submarine that carries nuclear warheads, one that is powered using nuclear energy, or both. In the UK, the Vanguard, Astute and Trafalgar class submarines are all powered using a nuclear reactor, but only the four Vanguard class submarines carry nuclear warheads – Astute and Trafalgar submarines are ‘hunter-killers’ designed to sink other ships. The UK’s current fleet relies on a reactor typically seen in power stations across the world – the pressurised water reactor (PWR). These compact power plants produce vast amounts of heat through the splitting of uranium-235 (235U). This fissile isotope exists in very small quantities (less than 1%) in natural uranium, which mainly consists of uranium-238 (238U). To use it as fuel, the 235U is increased relative to the 238U in a process known as enrichment. In the PWR, waste fission products are made, such as caesium, xenon and krypton, as neutrons split the 235U fuel, with 238U also absorbing neutrons to form plutonium. These fission products can damage the ceramic fuel and reduce the reactor’s efficiency. The vessel that contains this whole process is also bombarded with high levels of radiation over its operational life. What happens to a nuclear submarine once it is removed from service? Once a nuclear-powered submarine is decommissioned, it is placed into long-term storage. Only after monitoring the vessel will engineers begin to defuel and dismantle it. However, over the past four decades, this second part hasn’t happened in the UK. Since 1980, the UK Ministry of Defence has taken 20 nuclear-powered submarines out of service. Of these 20 subs, the UK has not fully disposed any of them and nine still contain highly radioactive nuclear fuel. The vessels have languished at dockyards in Plymouth and Rosyth. This is not a sustainable solution, but it is in stark contrast with other countries’ past policies. During the Cold War, the Soviet Union dumped 19 ships containing nuclear waste in the Kara Sea, as well as 14 reactors and the K-27 nuclear submarine. With such vessels continuing to rust on the seabed, there are concerns these sites could harbour a potential environmental crisis. However, the subs stored in the UK are constantly monitored in a controlled environment. 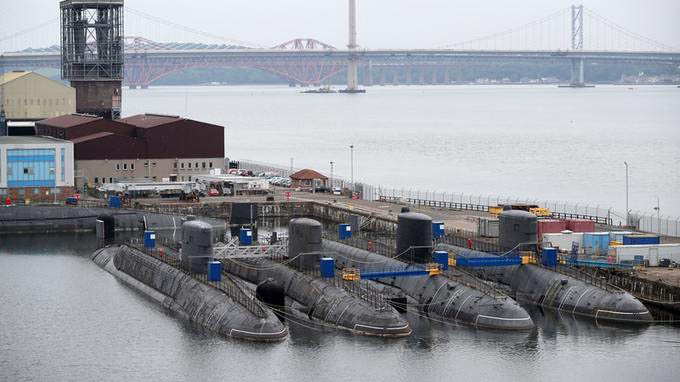 Although a far cry from the Arctic submarine graveyards, the UK fleet still lies exposed to salty water, with the vessels rusting in the dockyards. Why are the submarines still in storage? It is an incredibly complex situation, but the government stopped defueling its disbanded fleet back in 2004. The UK’s nuclear regulator deemed that the facilities were not up to standards, and the UK has been working to improve them ever since. Mired in delays and inflating budgets, the defueling may not restart until 2023 – the original start date was 2012. Even when the subs are ready for their next voyage through the disposal process, it is a journey fraught with complexity. What is the plan for the nuclear waste? Once defueling starts, the sub will be moved to a ‘reactor access house’ on rails. In this facility, engineers will remove the spent nuclear fuel from the sub, which contains various actinides and radionuclides. The fuel is highly radioactive and generates heat, so needs to be cooled in water before any further work can begin. To cool the fuel rods, the waste is sent to a specialised plant at Sellafield, where it is stored in vast water ponds. The water acts as both an efficient coolant and radiation barrier. Historically, this spent fuel would have then been recycled to form new nuclear fuel. During reprocessing, the fissile uranium and plutonium is separated through solvent extraction, before converting the remaining liquid waste into a glass for long-term storage. However, it is now unclear whether this will still happen. It is more likely that the spent nuclear fuel will be stored indefinitely after cooling. The current UK strategy is to bury this waste in a highly-engineered geological disposal facility, which would see more than 650,000m3 of waste stored in an underground cavern, according to recent government estimates. But plans are still ongoing and a facility is yet to be built. What happens to the submarine after defueling? After defueling, the sub will return to the ‘wet’ dock for another period of storage and monitoring. Following this, the submarine is dismantled. Components such as pipes and pumps exposed to radiation are taken away and the reactor vessel removed. However, engineers do not simply remove the reactor. In many countries, the reactor is lifted out with the two empty compartments either side of it and then sealed off to minimise the risk of exposure. After removing this ‘three-compartment unit’, the submarine is cast off for its final voyage to a commercial shipyard for recycling. But it will be a costly endeavour. The UK may face costs of up to £7.5bn if it wants to take the entire fleet through this voyage of defueling and disposal. It remains unclear whether the plans will stay on course, but the defence department has committed to dismantling the fleet ‘as soon as reasonably practicable’. In Ratnagiri’s Jaitapur, Fishermen Vehemently Oppose Nuclear Plant. By Ankit Panda, April 23, 2019 Less than two months after India’s worst crisis with Pakistan since 2002, Indian Prime Minister Narendra Modi has made repeated references to nuclear dynamics between the two countries at election rally addresses. India’s general elections began earlier this month and will run into mid-May, with Modi’s nationally dominant Bharatiya Janata Party (BJP) hoping seize on its stewardship of India’s national security to maintain a dominant position in the Lok Sabha (the lower house of India’s bicameral parliament). On April 17, at a campaign rally, Modi touted that India had called Pakistan’s nuclear bluff. It’s unclear if the prime minister was referring to a specific weapon. “Earlier, terrorists from Pakistan would come here and go back after conducting an attack. Pakistan would threaten us, saying it has the nuclear bomb and will press the button,” Modi said, underscoring what had long been a dilemma for India, whose conventionally superiority was undermined by Pakistan’s development of low-yield nuclear weapons in particular. “We have nuclear of nuclear bombs,” Modi said, intending to highlight India’s capabilities. “I decided to tell them, do whatever you want to do,” Modi added, promising that India would retaliate. The context of Modi’s remarks on nuclear weapons — election rallies — matter, of course. With a poor economic track record since 2014, the BJP has rightly decided to focus on what much of the Indian public perceives as a strength: its management of national security and defense. Within India, the decision by Modi to retaliate using conventional air power into Pakistani territory after the February 14 Pulwama attack was widely popular. But utterances on nuclear weapons do not take place in a vacuum and Modi’s remarks will be heard across the world. April 20, 2019 Months after Poovulagin Nanbargal, a Tamil Nadu based volunteer group working on environmental issues, raised concerns over the unusual number of outages of reactors at the Kudankulam nuclear power plant, the Department of Atomic Energy (DAE) has accepted the NGO’s claim. Kamlesh Nilkanth Vyas, the Secretary of the DAE and Chairman of the Atomic Energy Commission, in an interview to News18 Tamil Nadu, said that the Nuclear Power Corporation of India Limited (NPCIL) is trying to fix the issues faced by the Kudankulam power plant. This is the first time someone from the government is accepting that there are issues with the Kudankulam nuclear power plant. In November 2018, the group had written to the Atomic Energy Regulatory Board (AERB) seeking the appointment of a committee with independent experts to inspect Units 1 and 2 of the Kudankulam plant. In its 5-page letter, Poovulagin Nanbargal had stated that Unit 1 of the plant had tripped 40 times since it began its operations in 2013 and also listed a few instances of such outages. The letter had also called AERB’s attention towards the fact that on every instance the plant stops working, it takes at least four months for it to restart operations. ….. The letter also alleged that contrary to an order by the Supreme Court which made it compulsory for the NPCIL to report every outage that happens in the plant to the AERB, the NPCIL did not submit any report of these outages. …..